Mozart’s masterful comedy is richly reimagined in a boundary-busting production created by director Barrie Kosky and British theatre group 1927. 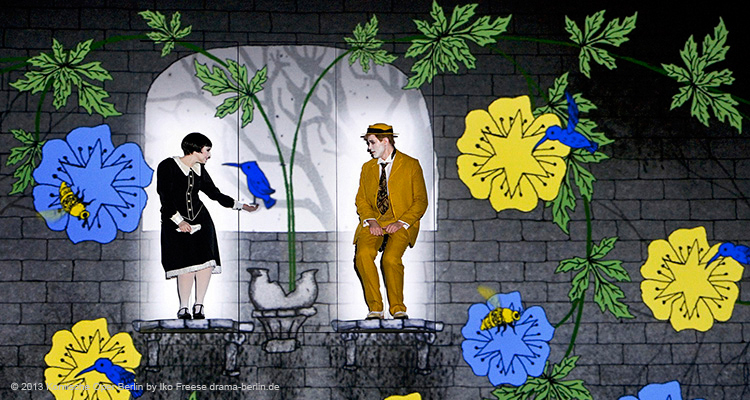 Connecting the tale’s enduring meaning with modern metaphor, this extraordinary staging has thrilled audiences with its stunning interaction between film animation and live performance. A production of the Komische Oper Berlin. Presented in co-production with LA Opera. Sung in German with English translations projected above the stage. Pursued by a serpent, Prince Tamino falls faint from exhaustion. Three Ladies in the service of the Queen of the Night slay the monster, then admire Tamino’s beauty. They fight over who will remain with him while the others fetch the Queen. Not coming to any resolution, all three depart. Tamino revives and observes the approach of Papageno, who catches birds for the Queen. In the course of becoming acquainted, Papageno claims he killed the serpent. The Three Ladies return and seal his mouth for telling the lie. They show Tamino a portrait of the Queen’s daughter, Pamina, and Tamino immediately falls in love with her visage. The Queen of the Night appears and asks he rescue Pamina from the temple of the tyrant Sarastro, where she is being held captive. As a reward, the young couple will be wed. Tamino agrees enthusiastically, and the Three Ladies give him a magic flute for protection. Restoring Papageno’s power of speech, they order him to accompany Tamino. He receives a set of magic bells. Three Spirits will guide their journey. At Sarastro’s temple, Monostatos is charged with guarding Pamina, whom he treats harshly. Papageno enters, and both men startle one another with their unusual appearance and momentarily flee. Papageno is the first to return, recognizes Pamina as the Queen’s daughter and tells her of the ardent young prince who has been sent to her rescue. She takes pleasure in the prospect of love, and Papageno too pines for his perfect mate. Elsewhere in the temple, Tamino comes upon the inner sanctuary, but is barred entrance. A priest tells him he has been deceived by a mother’s tears – Sarastro is not the evil person she described. Feeling lost, Tamino plays his magic flute and hears Papageno’s pipe in response; he then follows its sound. Back in Monostatos’s lair, Pamina and Papageno face recapture, but Papageno plays his magic bells, charming Monostatos and his slaves and allowing their escape. Sarastro enters magnificently, and Pamina admits her attempt to flee, but only to escape Monostatos’ amorous advance. Still, she misses her mother, but Sarastro proclaims there is still much for her to learn from his tutelage. Tamino is brought in and embraces Pamina, while Monostatos is punished for his dereliction. Sarastro announces before the Speaker and the priests Tamino’s wish to enter the sanctuary of wisdom and his willingness to undergo the trials of initiation. Papageno is more reluctant, but is promised a pretty wife, Papagena, as his reward. The first test is one of silence, a task Papageno has some difficulty achieving, especially when tempted by the Three Ladies. Elsewhere, Monostatos continues his lusty pursuit of Pamina, but is deterred by the arrival of the Queen of the Night. The Queen pleads with her daughter – the seat of power rests with the all powerful Circle of the Sun, which was wrongly taken from her and given to Sarastro. Pamina must kill him and take the Circle back – if she doesn’t, her mother will disown her. After the Queen’s angry departure, Monostatos offers to help in exchange for Pamina’s love. When she refuses, Monostatos again threatens her but is interrupted by Sarastro, who knows of the Queen’s plot. He forgives Pamina’s part in it, and Monostatos is banished from the Brotherhood. Tamino and Papageno continue to wait out their oath of silence, augmented by thirst and fasting. An old woman offers Papageno water and soon admits that her boyfriend’s name is “Papageno.” Before her identity is revealed, she is sent away with a clap of thunder. The Three Spirits then pay a visit and offer refreshments. Papageno eats heartily while Tamino plays his flute. The music brings forth Pamina, who is distressed when Tamino does not respond to her inquiries. She fears his love has vanished and considers taking her own life. Papageno tries to catch up to Tamino but is denied entry to the inner temple. The Speaker denounces him, stating that he will never know true enlightenment, yet Papageno is hardly bothered, for all he wants is a wife. He plays his bells, and the old woman reappears. Under threat of imprisonment, he begrudgingly agrees to be her husband. She is immediately transformed into a beautiful young woman, Papagena, but is whisked away by the Speaker – Papageno is not yet worthy. Demented by Tamino’s seemingly broken vow, Pamina wanders aimlessly, dangerously clutching a dagger. The Three Spirits take her to Tamino, who is about to undergo the trials of water and fire. Pamina and Tamino reaffirm their love, and she resolves to go through the ordeals at his side. Missing Papagena terribly, Papageno is about to hang himself, but is saved by the Three Spirits. He is told to play the magic bells, and to his great joy, Papagena is soon restored to him. They rejoice in a future together. Now in league with the dark side, Monostatos leads the Queen and her ladies in one last attempt against Sarastro, but all are vanquished. Dressed in priestly robes, Tamino and Pamina usher in a new era of truth, beauty and wisdom. Child wonder, virtuoso performer and prolific creative artist, Mozart is the first composer whose operas have never been out of repertory. His prodigious talents were apparent very early in his life; by the age of four he could reproduce on the keyboard a melody played to him, at five he could play the violin with perfect intonation and at six he composed his first minuet. A musician himself, Wolfgang’s father, Leopold, immediately saw the potential of his son’s talents. With the mixed motives of religious piety and making a tidy profit, Leopold embarked on a series of concert tours showing off the child’s extraordinary talents. Often playing with his sister Maria Anna (“Nannerl”), herself an accomplished musician, young Wolfgang charmed the royal courts of Europe, from those of Austrian Empress Maria Theresa, French king Louis xv and English king George iii, to the lesser principalities of Germany and Italy. As Mozart grew older, his concert tours turned into a search for permanent employment, but this proved exceedingly difficult for a German musician in a market dominated by Italian composers. Although many of his early operas were commissioned by Milanese and Munich nobles (Mitridate, Ascanio in Alba, Lucio Silla, La finta giardiniera), he could not rise beyond Konzertmeister of the Salzburg archbishopric. When the new prince archbishop, Count Hieronymus Colloredo, was appointed in 1771, Mozart also found he was released for guest engagements with less frequency. Though his position improved and a generous salary was offered, the composer felt the Salzburg musical scene was stifling for a man of his enormous talent and creativity. Things came to a head in 1781 immediately after the successful premiere of Mozart’s first mature work, Idomeneo, in Munich. The archbishop, then visiting Vienna, insisted the composer join him there. Never did Mozart better understand his position in the household than during that sojourn, when he was seated at the dinner table below the prince’s personal valets and just above the cooks. He requested to be permanently discharged from his duties, and after several heated discussions his petition was granted, punctuated by a parting kick in the pants. Now completely on his own for the first time, Mozart embarked on several happy years. He married Constanze Weber, sister to his childhood sweetheart Aloysia, and premiered a new work, Die Entführung aus dem Serail (The Abduction from the Seraglio), at the Burgtheater. 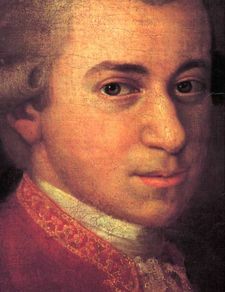 Mozart also gave concerts around Vienna, presenting a number of new piano concertos and symphonies. His chief concern was to procure a position at the imperial court. A small commission came his way from the emperor for a one-act comedy, Der Schauspieldirektor (The Impresario), given in the same evening as Antonio Salieri’s Prima la musica, e poi le parole (First the music, then the words), to celebrate the visit of the emperor’s sister, Marie Christine, and her husband, joint rulers of the Austrian Netherlands. The Marriage of Figaro, Mozart’s first true masterpiece for the imperial court, premiered at the Burgtheater in 1786 and went on to Prague the following year where it was a huge success. Don Giovanni premiered in Prague in 1787 to great acclaim, but its Vienna premiere in 1788 was coolly received. By this time, Mozart had received a minor Imperial posting, Kammermusicus, which required him to write dances for state functions. The position was hardly worthy of his skills and generated only a modest income, a weighty concern now that debts had begun to mount. Joseph ii commissioned another opera from Mozart, Così fan tutte, which premiered January 26, 1790. The emperor was too ill to attend the opening and died the following month. His brother, Leopold ii, assumed leadership, and Mozart hoped to be appointed Kapellmeister – instead he merely received a continuance of his previous position. Crisis hit in 1791. Constanze’s medical treatments at Baden and the birth of a second child pushed their finances to a critical point. Mozart’s friend and fellow Freemason, the impresario Emanuel Schikaneder, suggested he try his luck with the suburban audiences at his Theater auf der Wieden. Composition of The Magic Flute began early that summer but had to be halted when two generous commissions came his way: a requiem for an anonymous patron (who hoped to pass it off as his own composition), and an opera seria to celebrate the new emperor’s coronation as King of Bohemia. La clemenza di Tito premiered September 6, and The Magic Flute was completed in time to open September 30. The Requiem, however, remained unfinished, and as Mozart’s health began to fail, the composer feared he was writing his own death mass. In December Mozart died at the age of 35 and was given a simple funeral by his impoverished widow, then buried in a mass grave on the outskirts of Vienna. This entry was posted in Music, OPera and tagged Barrie Kosky, Komische Oper Berlin, Magic Flute, Minnesota Opera, Monostatos, Pamina, Papageno, Sarastro, Tamino. Bookmark the permalink.